BIRMINGHAM, Ala. – The Bassmaster Angler of the Year Championship will be held Sept. 20-23, 2018 on Lake Chatuge on the Georgia/North Carolina border, and will feature the 50 top-ranked Bassmaster Elite Series anglers, based on Angler of the Year points earned during the nine-event Elite season, said Bruce Akin, CEO of B.A.S.S. Akin also revealed that the 2018 Classic Bracket tournament will be held Oct. 23-26, also in northern Georgia, at 3,200-acre Carters Lake near Ellijay. Earlier today, Akin announced that the 2018 Bassmaster Texas Fest tournament, one of the nine regular-season events of the Bassmaster Elite Series, will be held May 17-20 on Lake Travis near Austin, Texas. In addition to the $100,000 prize that goes to the Angler of the Year, the contestant who weighs in the heaviest total catch of the event will receive $25,000. The rest of the $1 million prize fund will be awarded to the Top 50 pros based on their final standings in AOY points. The event also determines at least 36 qualifiers for the Classic from the Elite Series. Previous AOY championships have been held at Escanaba, Mich.; Sturgeon Bay, Wis.; and, for the past two years, Mille Lacs Lake in Minnesota. All three areas are renowned for their trophy smallmouth fishing. 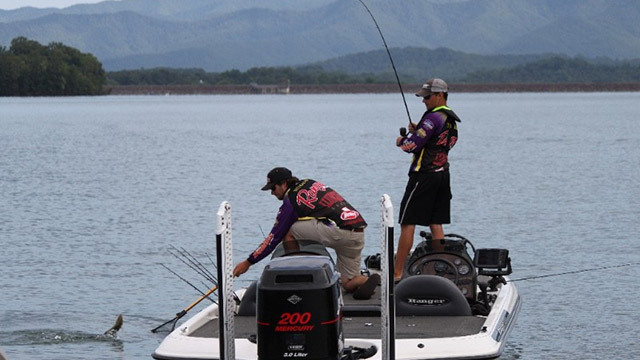 The AOY Championship will mark the first time for a professional Bassmaster tournament to be held on Lake Chatuge, a 7,500-acre Tennessee Valley Authority impoundment, but it hosted Carhartt Bassmaster College Series Championship tournaments in 2013 and 2014. Weigh-ins and other activities will be at the Towns County Conference and Recreation Center in Young Harris, Ga. The four-day Classic Bracket tournament provides one final opportunity for one Elite angler to qualify for the 2019 GEICO Bassmaster Classic. Conducted entirely in front of Bassmaster LIVE cameras, the Classic Bracket follows a catch-weigh-release format. Anglers compete head-to-head, trying to compile a heavier five-bass catch than their opponents, until only one is left standing. Qualifiers are the first eight anglers in AOY points below the cut to the Classic. Jacob Powroznik, an Elite Series angler from Virginia, prevailed in this year’s Bracket to earn an invitation to the 2018 Classic, to be held March 16-18 on Lake Hartwell at Anderson, S.C.
Carters Lake is a U.S. Army Corps of Engineers impoundment of the Coosawattee River in Gilmer and Murray counties in the Blue Ridge Mountains of north Georgia. With a maximum depth of 547 feet, it’s the deepest reservoir in the state, and one of the most scenic. For more information about these and other Bassmaster tournaments, visit Bassmaster.com. For information about the Lake Chatuge area, visit golakechatuge.com, and for more on Carters Lake and Ellijay, go to explorethemountains.com.